Israel Yinon dies of unknown causes while conducting symphony in Switzerland. Renowned Israeli conductor Israel Yinon collapsed and died as he was conducting a concert in the Swiss city of Lucerne late Thursday, a spokesman said. According to local media, the 59-year-old was in the middle of leading 'An Alpine Symphony' by German composer Richard Strauss when he slumped, falling headlong to the ground. Volunteers immediately rushed to do CPR; the orchestra hall was emptied after it was made clear that Yinon had suffered a severe injury. The cause of death was not immediately clear, but local media speculated that a head injury sustained from the fall could be a contributing factor. Born on January 11, 1956 in Kfar Saba in Israel, Yinon studied conducting, music theory and composition at the Rubin Academy of Music in Tel Aviv Jerusalem's Music Academy. 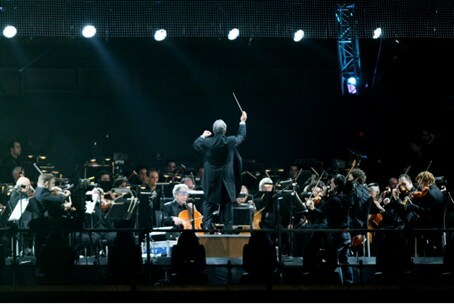 Yinon served as guest conductor with numerous orchestras, including the BBC Symphony Orchestra, the Jerusalem Symphony Orchestra, the London Royal Philharmonic, Royal Antwerp Flemish Philharmonic, the Vienna Symphony and the German Symphony Orchestra Berlin.